Quakers from North Carolina, craftsman from Germany, farmers, industrialists, financiers, inventors...Wayne County, Indiana's heritage is represented by a wide range of unique people who have left us a fascinating legacy. Explore your heritage by tracing your family tree! Wayne County Genealogical Society - a local club that promotes the preservation of genealogical information. They maintain a library of local resource material. Research is offered by mail for a fee. Wayne County Research Resources - valuable information on where to locate records, important dates and localities, by Arnold Dean. Wayne County Government - Wills, property records, legal records. Some early marriage records are available on-line. Wayne County Birth or Death Certificates - at the Wayne County Health Department. Wayne County Marriage License Database - This new database will allow searches by name and date range. So far, the records from 1811 through 1903 have been entered. If they haven't gotten to the era you're interested in yet, just check back in a few months. Earlham Library - an excellent collection of Friends materials. 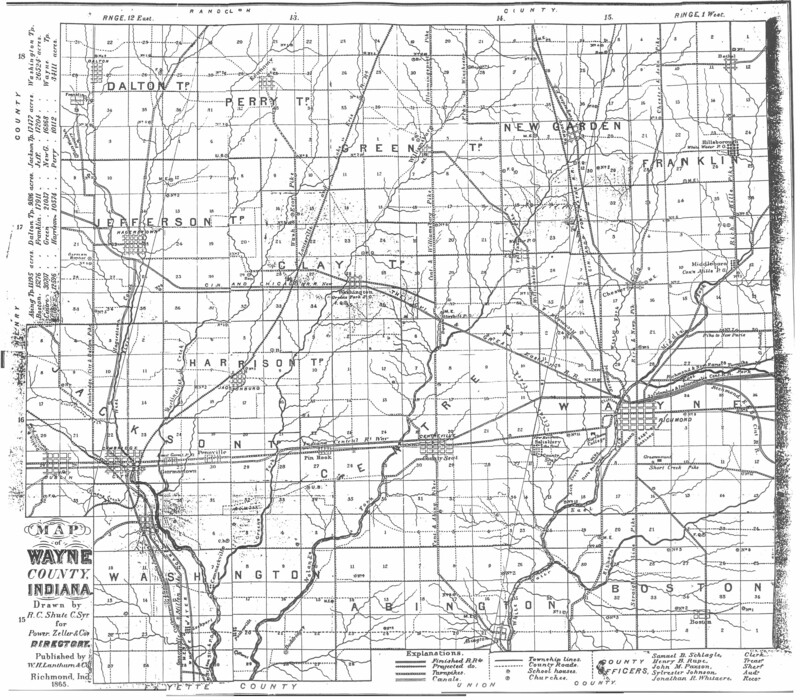 Many of the original settlers to the Wayne County area were Quakers - thus many trails lead here. Morrisson-Reeves Library - Offers an excellent collection of local history and genealogical information. Morrisson-Reeves Library Newspaper Index - This index is a collection of local interest articles and obituaries from Richmond newspapers, focusing on the Wayne County area. It contains information as far back as 1822. Local papers such as The Palladium, The Richmond Item, The Richmond Sun Telegram, The Daily Sun, The Richmond Telegram, The Richmond Independent, The Broad Axe of Freedom, and The Grubbing Hoe of Truth are included, as well as many others. Note: you will not be able to access the actual article online. You will be able to search by words (such as a surname) and then sort by date or publication. By highlighting an article, you will be able to access details about the article, such as the publication, date, and location within the publication. You can then take that information to the library and request the microfilm with that publication and date. Civil War Database - searchable database of the military service for individuals who enlisted in Wayne County, IN compiled from the Directory and Soldiers' Register of Wayne County, Indiana (published 1865). Wayne County Genealogical Society - maintains a library of local resource material. Call for an appointment. Wayne County Bibliography - a list of books pertinent to Wayne County History and genealogy research compiled by Katie Bond. Richmond and Wayne County, IN Veterans of World War II - a personal web site, not complete. Richmond Street Names - In January 1881, the city passed an ordinance changing the streets and avenues of Richmond. Main Street became the base for naming the streets running west to east. Its name was not changed. The Whitewater River became the base for the streets running north to south. Virtual Tour of North 10th Street, Starr District - gather information about some of Richmond's most prominent families during the late 1800's. Quakers(Society of Friends) in Richmond and Wayne County - learn about the beliefs of the Quakers, local Quaker history, and photos of local Quaker points of interest, including local meetinghouses. Brochure: Quakers(Society of Friends) in Richmond and Wayne County - learn about the beliefs of the Quakers, local Quaker history, and photos of local Quaker points of interest, including local meetinghouses. Allen County Public Library Genealogy Center - Located in Fort Wayne, Indiana this nationally renowned genealogy collection contains more than 220,000 printed volumes and 251,000 items of microfilm and microfiche. Ancestry.com - lots of online databases, some may be searched for free. Cyndi's List - a comprehensive listing of genealogy links. Higginson Books - an online genealogy bookstore, offering local titles. RootsWeb - lots of free, searchable resources. WorldConnect Project - over 35 million searchable GedCom's. If you are aware of any other links that would be helpful to others in their search within Wayne County, Indiana, please notify the Director at info@waynet.org.